Since the Honda Challenge Cup 2009, I have fallen in love with Honda cars. In fact, my wife and I will soon venture into what we call our "City Project". We plan to pay off all our debts soon and then save up for a down payment for a new Honda City. Honda Cars Philippines has been sending me information about their technology and I am loving what I have been learning about them. I would like to share with you about Honda's engines which started from CVCC (Compound Vortex Controlled Combustion) engine in 1974 (I wasn't born then) to the VTEC (Variable Valve Timing and Lift Electronic Control) engine which developed into the VTEC 3 engine in the 90's, to this century's i-VTEC engine which is Honda's latest breakthrough in Variable Timing Control (VTC). In the same way two long chains of nucleotides determine who we are, each Honda car is created out of two principles embedded in its long and colorful tradition, “fun in driving” and “care for the environment”. Much like our DNA, the combination of these two principles governs how each Honda car should be built. For years, however, US car manufacturers were challenged to create the car that could deliver the power consumers demanded and at the same time do what was then deemed impossible: pass the U.S. Clean Air Act. But this predicament was before 1972. Before Honda shocked the world by doing the impossible. The CVCC or Compound Vortex Controlled Combustion engine characterized Honda’s relentless pursuit in finding the perfect balance between “fun driving” and “care for the environment.” Before the CVCC, car manufacturers had to install catalytic converters to reduce the toxicity of the emissions. Honda redesigned the engine to optimize the amount of fuel burned thereby producing cleaner emissions and better fuel mileage. The U.S. came to know the CVCC engine through the 1974 Civic, which was also the first model to pass the U.S. Clean Air Act. The CVCC engine cemented Honda’s reputation, especially in the U.S., as a manufacturer of well-built economy cars. And as prices of gases went up during the oil crisis of 1973, Honda left many competitors in the dust with its reliable, economical models. Then, in the 1980’s, as consumers demanded for even more powerful cars with more economy, Honda once again accepted the challenge. Honda realized that the new demand called for a new breed of engine. Increasing the power output may have been easy; but Honda’s goal of producing 100 hp per liter was no mean feat considering that most 4-cylinder engines of that time were averaging only 50-60 hp per liter. But Honda was used to redefining the car industry. And it did so in style when it shattered all engine myths and, for the first time, put driving performance and fuel efficiency in one specs sheet. The Variable Valve Timing and Lift Electronic Control or VTEC engine revolutionized the car industry with its two differently shaped cam lobes and two rocker arms per cylinder for two different combustion settings. This allowed the engine to regulate valve operation and optimize performance at all engine speeds. During low engine speeds, the valves are made to open a relatively small amount for better economy. As the car kicks in to higher engine speeds, the valves are made to open wide for higher air and fuel intake thereby delivering more power. This way, the VTEC technology was able to combine spirited, powerful performance, fuel efficiency, and cleaner emissions in one engine. In the next few years, Honda devoted more time and research to further develop this DNA and meet the needs of society for fun-to-drive but environment-friendly cars. By the late 1990’s Honda came up with the 3-stage VTEC engine or VTEC 3, so called because of the three stages the engine goes through to boost engine power and fuel efficiency. At less than 2500 rpm, it turns off one intake valve per cylinder in the 16-valve engine to save fuel. From 2500–6000 rpm, all the valves are used and it functions like a normal VTEC engine. As the rpm rises to 6000, a wild cam lobe is engaged to increase the engine’s performance. Then, the 21st century came and Honda welcomed it with its latest breakthrough in Variable Timing Control or VTC. 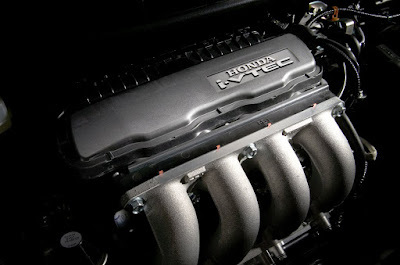 This new innovation gave birth to an even more powerful incarnation of the VTEC engine—the i-VTEC. Whereas the previous VTEC engines are only capable of controlling valve lift and duration during distinct low and high rpms, the i-VTEC engine had continuous phase control of the intake valve depending on engine load rotation. This allowed for better balance between high power and fuel economy and resulted to even cleaner emissions. Honda’s desire to perfect the balance between driving performance and eco-friendliness would push it to even greater heights. In mid-2000’s Honda unveiled the new lighter, shorter, and quieter i-VTEC engine. This new engine, which now serves as the base for all new Honda car models, makes the most of every drop of fuel by delaying intake valve closure timing during low-load conditions, thereby improving Honda’s already impressive fuel economy. Knowing Honda, this latest i-VTEC engine wouldn’t be the last in a line of breakthroughs that have reshaped the car industry. Honda’s quest to create sporty, fun-to-drive vehicles that have the least impact on the environment is, to say the least, truly ingrained on its DNA. And as Honda explores other ways to make greener and spirited engines, the car buying public can rest assured that the future generation of cars will come from a very good family. To know more about Honda’s latest products and technologies, log on to www.hondaphil.com.